I didn’t catch chickenpox as a young child but succumbed to it, along with my sister as a teenager at Secondary School. I remember feeling ill and weak a few days earlier but tried to carry on. By the time the spots were out and I was diagnosed with chicken pox I felt better but had to stay off school as I was still contagious. My neighbour used to come around with folders of school work for me to keep up. I really enjoyed all the school work but I used to finish it really quickly and I got through lots of books in this time. It felt like an age waiting for all the itchy spots to heal, I scratched some and still have chicken pox scars to this day. Dave caught chickenpox as an adult when I was pregnant with Danny. Chickenpox in pregnancy can cause complications, although the risk is low. It’s also very rare to catch chickenpox more than once because our immune systems make antibodies that fight and overcome the virus. Both then stay in our bodies for the rest of our lives. but it is possible (as I’ve seen for myself). Therefore, to be on the safe side we put Dave in quarantine at his parent’s house (he loved it as he had a week of uninterrupted gaming!) until all the spots healed. Danny was about two years old and we were sitting in his paddling pool together cooling off from the warm weather. I noticed one spot, then another and another. It was almost as if they were appearing before me. When we came inside, I checked one of my parenting books (nowadays I’d used the internet) and could see that his rash most looked like chickenpox spots. I remembered that he had been grizzly and moody a few days earlier, so it made sense. This was confirmed when the spots started developing into fluid filled blisters. Due to Danny’s heart condition, we were in regular contact with his health visitor so we let her know and she was happy that we felt confident to treat him at home. It’s best if you can avoid taking children to the GP so there is no chance of infecting vulnerable members of the public. Always ring them if you are concerned. My two eldest daughters also contracted chickenpox. This time I knew what to expect. When chickenpox was “doing the rounds” locally and my girls felt poorly, had lost their appetite and were tired I suspected they might have chickenpox and sure enough the spots developed. 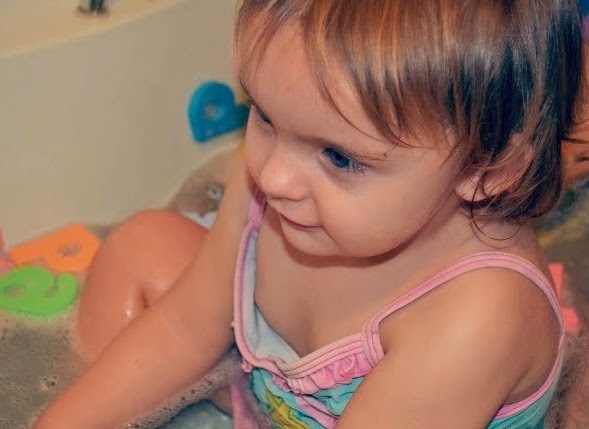 My youngest, Isabelle hasn’t yet had chickenpox. Chickenpox is a mild but infectious disease that is caused by a virus called varicella zoster. It can be caught all year round but infections usually peak between March and May. Nine out of ten children in the UK will catch it before adolescence – most before they are 5 years old. This is followed a few days later by a red rash that looks like clusters of pimples or insect bites. The spots can look like raindrops on a rose petal. The rash can appear anywhere on the body and face including behind their ears, on their scalp and even the soles of their feet. So often, there’s a eureka moment once the spots develop as you realise why the child (or adult) has been feeling so poorly. There is no cure for chickenpox but treatments can help to relieve the symptoms. There is no need to visit the GP if you can treat the child at home. Children do need to be kept off school and in quarantine until all the spots are crusted over and no longer contagious. If your child has has had a loss of appetite or a fever then they will be losing fluids so give them plenty of water to replace the lost fluid. If your child has a fever, you can give them some infant paracetamol (see pack for correct dosage). If their fever is above 39℃ seek medical advice. 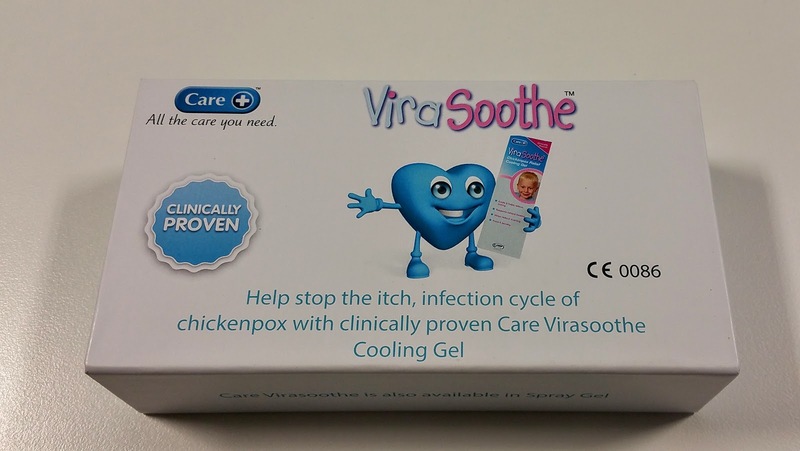 Care ViraSoothe Cooling Gel is clinically proven to help relieve the irritating symptoms of chickenpox by cooling the skin and relieving itching. It’s available to buy at Boots. For more information on chickenpox visit All The Care You Need. It’s always great to be prepared for childhood illnesses. 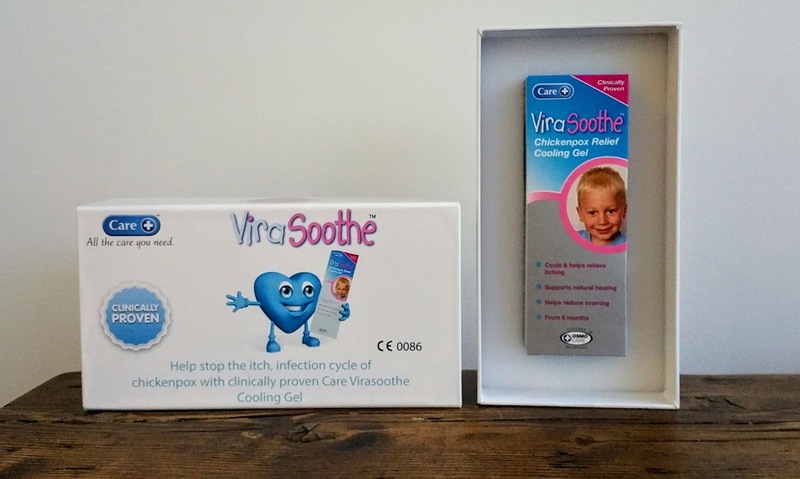 If you would like to win ViraSoothe Cooling Gel in a branded box then enter the Rafflecopter below (remember to read the terms and conditions). Good luck!